Accueil » Sur le terrain » A la rencontre des Français hors de France » Conférence de presse avec M. Arnold Cassola, candidat des Verts Maltais aux prochaines élections européennes sur la nécessaire révision du Règlement Dublin II (droit d’asile et mobilité au sein de l’Union Européenne) – 21/01/14 à la Valette(Malte). Conférence de presse avec M. Arnold Cassola, candidat des Verts Maltais aux prochaines élections européennes sur la nécessaire révision du Règlement Dublin II (droit d’asile et mobilité au sein de l’Union Européenne) – 21/01/14 à la Valette(Malte). Communiqué faisant suite à la conférence de presse organisée Mardi 21 janvier 2014 à 10h à la Valette (Malte) avec la sénatrice écologiste Kalliopi ANGO ELA et M. Arnold CASSOLA, candidat des Verts Matlais et Européens aux prochaines élections européennes. Migration: save lives and drastically revise the Dublin convention, Greens say. French Green Senator Ango Ela Kalliopi stated: « The increasing migrant tragedies in the Mediterranean demand that Europe truly implements policies for the prevention of such deaths by developing measures of legal migration and by issuing temporarary humanitarian visas in order to afford the necessary protection to such vulnerable people. 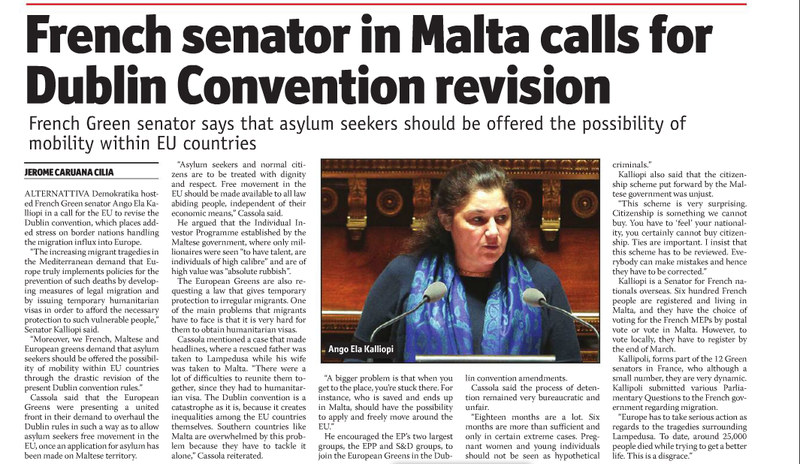 Moreover, we French, Maltese and European greens demand that asylum seekers should be offered the possibility of mobility within the EU countries through the drastic revision of the present Dublin convention rules ». Alternattiva Demokratika Chairperson, Prof. Arnold Cassola, said: « We European Greens are presenting a united front in our demand to overhaul the Dublin rules in such a way as to allow asylum seekers free movement in the EU once an application for asylum has been made on Maltese territory. Asylum seekers and the normal citizens are to be treated with dignity and respect. The concept established by the Maltese government that only millionaires have talent, are individuals of high calibre and of high value is absolute rubbish ». Veuillez trouver ci-dessous un article de Maltatoday concernant la conférence de presse à laquelle j’ai participé ce Mardi 21 janvier 2014 à la Valette (Malte). Alternattiva Demokratika hosted French Green senator Ango Ela Kalliopi in a call for the EU to revise the Dublin convention, which places added stress on border nations handling the migration influx into Europe. « The increasing migrant tragedies in the Mediterranean demand that Europe truly implements policies for the prevention of such deaths by developing measures of legal migration and by issuing temporary humanitarian visas in order to afford the necessary protection to such vulnerable people, » Senator Kalliopi said. Cassola said that the European Greens were presenting a united front in their demand to overhaul the Dublin rules in such a way as to allow asylum seekers free movement in the EU, once an application for asylum has been made on Maltese territory. « Asylum seekers and the normal citizens are to be treated with dignity and respect. Free movement in the EU should be made available to all law abiding people, independent of their economic means, » Cassola said. The European greens are also requesting a law that gives temporary protection to irregular migrants. One of the main problems that migrants have to face is that it is very hard for them to obtain humanitarian visas. Cassola mentioned a case that made headlines, where a rescued father was taken to Lampedusa whilst his wife was taken to Malta. « There were a lot of difficulties to reunite them together, since they had to humanitarian visa. The Dublin convention is a catastrophe as it is, because it creates inequalities among the EU countries themselves. Southern countries like Malta are overwhelmed by this problem because they have to tackle it alone, » Cassola reiterated. He encouraged the EP’s two largest groups, the EPP and S&D groups, to join the European Greens in the Dublin convention amendments. Kalliopi also said that the citizenship scheme put forward by the Maltese government was unjust. Kalliopi is a Senator for French nationals overseas. 600 French people are registered and living in Malta, and they have the choice of voting for the French MEPs by postal vote or vote in Malta. However, to vote locally, they have to register by the end of March. Pour consulter l’article en maltais du Maltarightnow, veuillez cliquer ici. One of the proposals of the Green Party European Parliament election on May that follows will be to change the Council of Ministers of the Dublin Convention so that when immigrant has applied for refugee status in a member state of the European Union , it can go in the same Union countries . In comments to reporters , Prof Arnold Cassola , who will be contesting the elections on behalf of the AD explained that this proposal will be included in the electoral program expected to approve the Green Party European of next month in Brussels . He said that does not make sense to who has the money and buy citizenship , have the privilege to go from one country to another without restrictions , and those not money but has refugee status can not make this. Currently, here in our country and the French Green Senator ANGO ELA Kallioppi, which in its comments to the media talked about tragedies increase in immigrants in the Mediterranean , specifically to that of Lampedusa , and said that Europe should work on a political level to prevent these deaths . The Dublin II establishes the principle that a member country of the European Union it is responsible for an asylum application . Therefore it is considered as a system that puts too much pressure on countries such as Malta are watching border continuous arrivals of immigrants. She added that the Greens believe that those seeking asylum have the possibility to move from one place to another within the EU countries through a drastic revision of the existing rules of the Dublin Convention . He said that free movement in the EU should be possible for anyone who respects the law , regardless of his or her economic means .